Apple today announced iOS 8 and OS X Yosemite at WWDC 2014, and a lot of people interested in technology watched the event - including Apple’s rivals. Take Nokia, for example - which, as a phone maker, is now part of Microsoft, and didn’t want to go unnoticed during WWDC. The official Nokia US twitter account tried to troll Apple’s announcements with various tweets that included the #wwdc hashtag, all while advising people to make the switch to Lumia smartphones. Nokia’s tweets included references to Windows Phone 8.1’s Word Flow - which allegedly provides “the fastest typing in the world”, thus possibly being better than iOS 8’s new QuickType. The company also reminded us what a Lumia smartphone could do in the Yosemite National Park: take (good) photos. Another tweet allows Lumia fans to win a Nokia DC-19 universal portable USB charger by saying what made them switch, or want to switch from iOS (see the third source link below). Nokia even tweeted: "we think Joe Belfiore has better hair” than Apple’s senior VP of Software Engineering Craig Federighi (who was on stage at WWDC to talk about both OS X Yosemite and iOS 8). Well, we definitely didn't see that coming. All in all, it's always fun to see competing companies fighting for attention, isn't it? Nokia was doing stuff like this before the purchase. Stop whining about this issue already!! The Deal is done! Move on!! We should all move on. Your right. Away from Microsoft and Nokia. Microsoft is even working on a Nokia X2 that will have Googles play store. What's wrong with WP? Oh thats right Poor sales, which even decreased in Q1 in Europe by 20%. So Microsoft has to turn and use Android to make the needed sales and revenue. Move on indeed. This is the problem. They are doing nothing this days. They are still earning money from old time. Future sounds good? decreased in Q1 in Europe by 20% ??? What Europe do u speak of ,Europe of Mars?? All Kantar and IDC reports articles in all tech sites all have one title in common " WP is increasing in Europe"
Don't worry he is a paid Google troll, his job is to bash Windows Phone while Google steals WP design language and features. Are you kidding me? 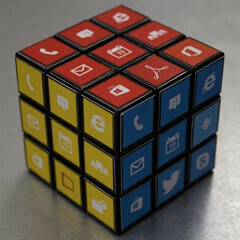 Nokia poked fun at the competition all the time with their social media outlets. It's one of the things they were known for in recent years. And it's neither repulsive nor "trolling", it's positive marketing. Apple put their 2013 event right at the long-planned Nokia World in Abu Dhabi. This is just a minor taste of Apples own medicine for their douchebaggery that year. Johnnokia has a point -- Nokia started doing a lot more of these lowbrow repulsive sorts of things after they switched to Windows Phone, i.e. when they became an unofficial Microsoft subsidiary. Nu-uh, we all know Stephen Elops and Satya Nadella sat and wrote these tweets together in an attempt to create an evil market monopoly! They already have an evil market monopoly -- it's called Windows. Mobile is running the world these days. Google hold the monopoly there guess that must make them really evil to right?. Yes, that's right. Monopolies have long been recognized as evil. Google's monopolies on search and ads are not good for anyone. I hope to see you share that sentiment ( the monopoly )about Android marketshare within Android articles. Agree, and unlike Apple, Nokia allow us to comment on its YouTube videos. That's what nokia say Connecting People. Oh shut it. Nokia has been doing these cheeky but true marketing long before MS acquired the D&S division. Leave it to the trolls to write ignorance. Remember about galaxy s4 zoom troll?? hello idiot ther is only one company who make inovation and that is only microsoft . rest like apple and google they know only one thing how to stole data and copy other design . the main thing is they dont know how to work . You're in serious problem...visit a doctor before your brain burst because of your blind fanboyism..
II like Lumias andWPindows OS, but they're trying too hard. Nothing anyone can say will convince an iphone user to switch. Iphone users are exactly like people in abusive relationships; nobody will ever be able to convince them to leave, they have to come to the realization that they made a terrible choice all on their own. But the truth is WP is giving a quite unique experiance unlike Android and iOS that are very similar in many way and much icon based. WP is the fastest and lightest of those, and the homescreen is giving a good overview. WP are lacking apps and do not have many competitive phones in the market, though.